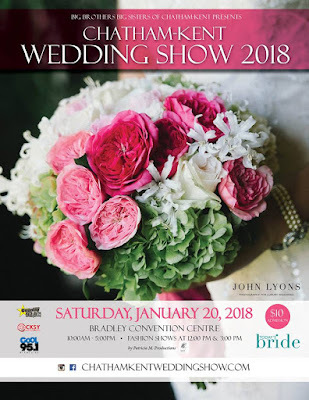 Wedding Show AND Free Make & Take TODAY! Sooooooo......yes. These beauties are shipping to The Paper Pickle as I type this! I am SOOOOOO excited. Such a great release of colours too! I believe we will be one of the first stores in the area with this product. I thought I would have a little thank you for those who shop with me. I know it can be exciting doing the pre-orders with companies on line but honestly, we often get our shipments in at the same time or even before these stores. I appreciate those who wait to shop with me. If you want brick and mortar store to exist, support them! Anyone who orders all 12 colours will receive 18% off your order. That is a pretty substantial savings! So you have been watching all the videos from Creativation (formerly CHA) and you are drooling over.......? Shoot me an email and let me know what is on your wish list. I would be happy to get you a price. Basically you can count on my pricing to be the US$ MSRP plus exchange (which is hovering around 1.3). This class is filling up quickly but we do have a few spots left. This technique is incredible! Please call the store or stop in during store hours to sign up. We would love for you to join us. 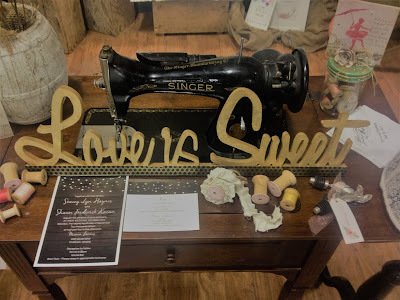 I had a little fun on Sunday and created this beauty using the muslin bags we have at the store and some of the gorgeous new Valentine paper lines. The album measures 3x4 and is the perfect size for Instax photos and other little pictures you may have around the house. Kits are $15+HST. Let me know if you are interested and I would be happy to prep a kit for you. Ready to get back into classes? Here's one to get us warmed up. These cards are stunning! 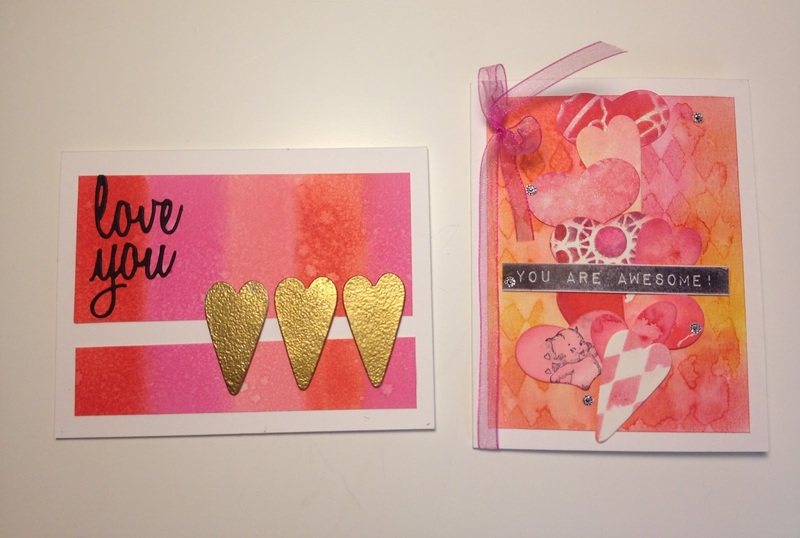 Work with various inks, sprays, embossing powders, dies and more to create the perfect card for your special someone. 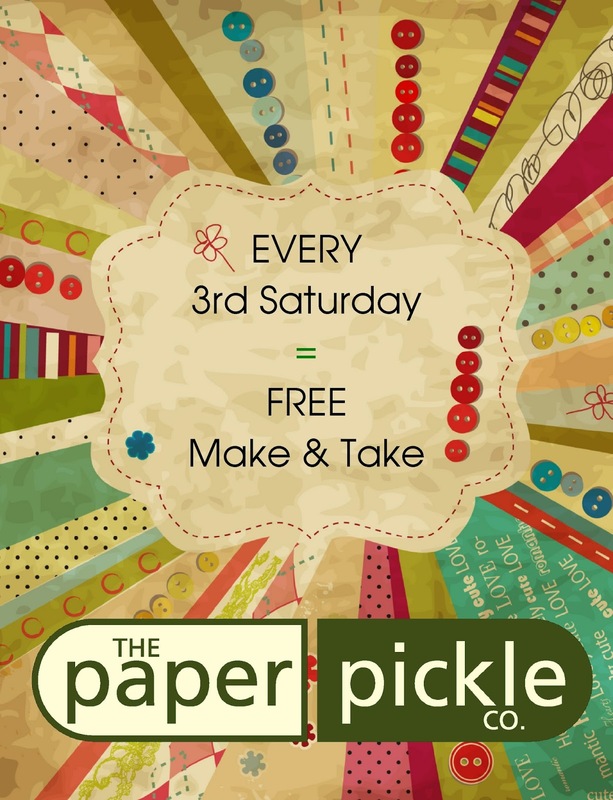 Great for card makers of all levels. Please call the store or stop in to register in person. Come and join us! We'd love to show you what we've got. 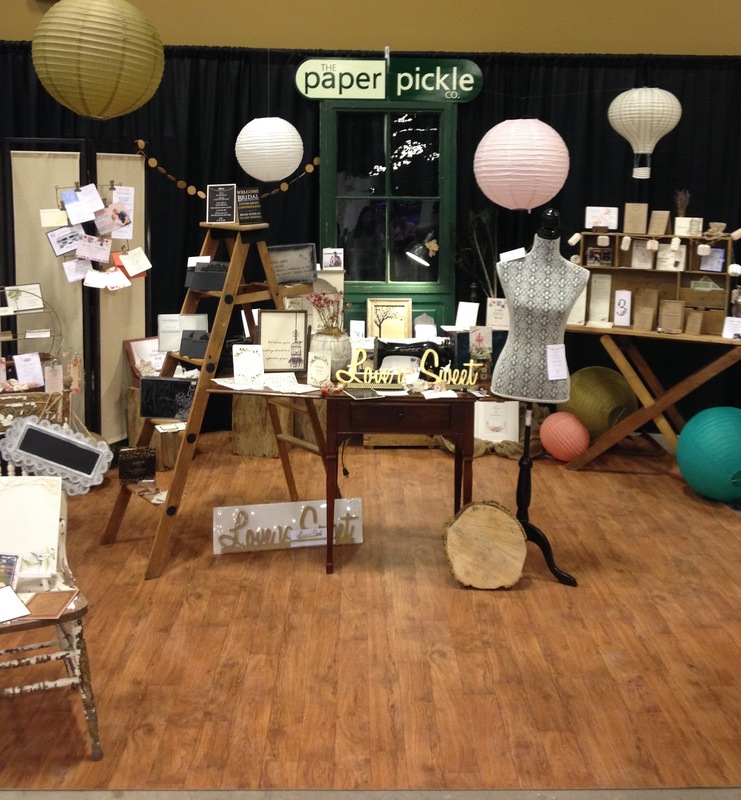 Fact 2: I LOVE designing and creating projects for both myself and my customers. 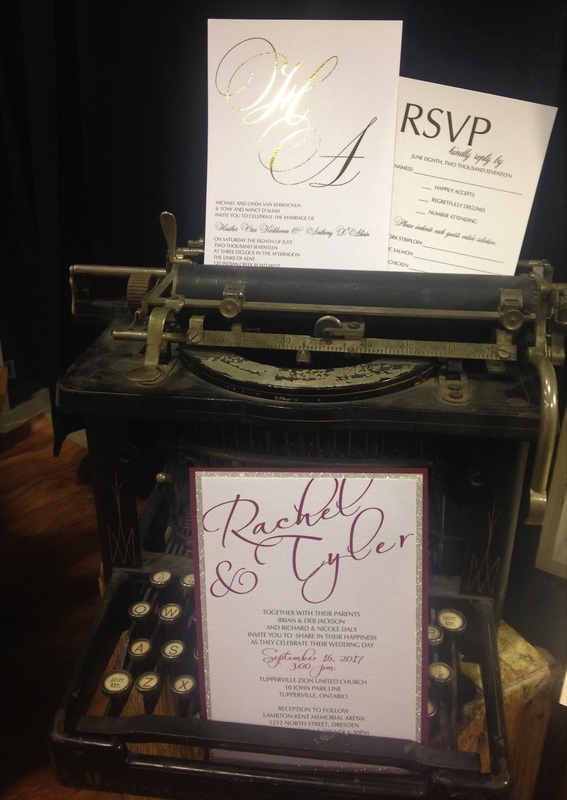 Fact 3: I live to plan parties and I just love when things come together to create something magical. Imagine walking through these doors to find the prettiest of creations. You can feel the love the moment you set foot in this space. Each and every customers' needs are carefully assessed and their vision is brought to life with attention to detail. Of course she would have a Singer. Only the best tools for her to work her magic. Oh. Please don't mind the mess with vintage spools and trims here and there. Besides this IS her studio. Sometimes a girl's got to type a letter or two to customers. 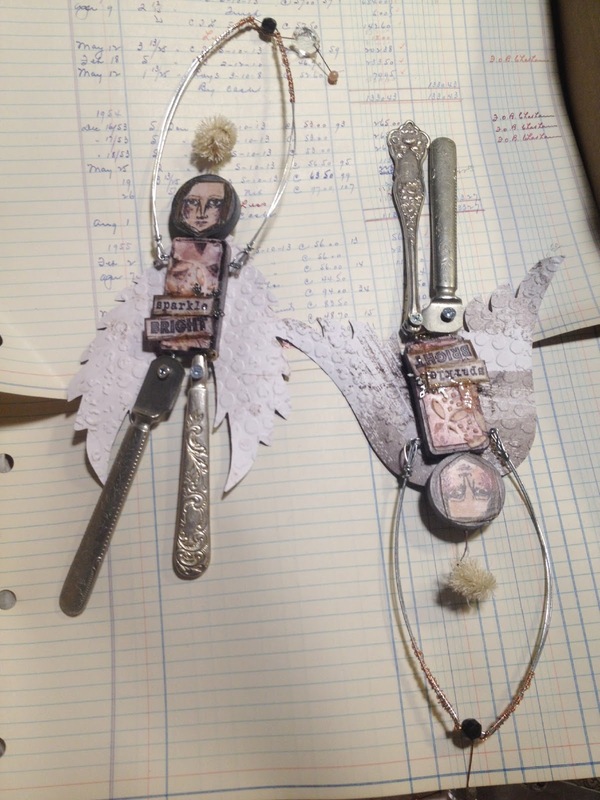 No time to type today....Let's use this beautiful tool to display her latest designs. Fun with fonts? Any time. Any where. Pretty projects are hanging everywhere! She loves to showcase her designs for others to see. She has the most imaginative of customers with ideas all their own. She listens intently and makes their ideas happen. With over 14 years of experience, she gets a little excited when they want to do something a little different. Her work is a reflection of her customer's personality. It's a nautical kind of day you say? She says set sail.....the time is right. Don't forget to stop and smell the roses. She likes her pretty things and doesn't mind a flower or two in her work space. More lovely creations that have brought joy to her customers. Phew. That was quite the tour. Please won't you sit for a cup of tea? So what did you think? Magical? ♥ Let me share my love of design with you for your next event. I will help bring your ideas to life. I'm creative, professional and fun. Let's do this....together! Note: It is best to set up an appointment to discuss stationery. You can email me anytime. Appointments outside of store hours (evenings etc.) are usually best for me! Oh it's on! Join us from 10-3 TODAY (Saturday) for a sweet Valentine's card. Remember spinner cards? Well they are back and easier than ever thanks to dies from Mama Elephant. Three dies for $6.50? They are a steal. PS....While Jules and Jen are having a blast at the store, I will be showing them what I got at The Chatham-Kent Wedding Show (10-5). Stop in and check out my designs and my pretty booth. 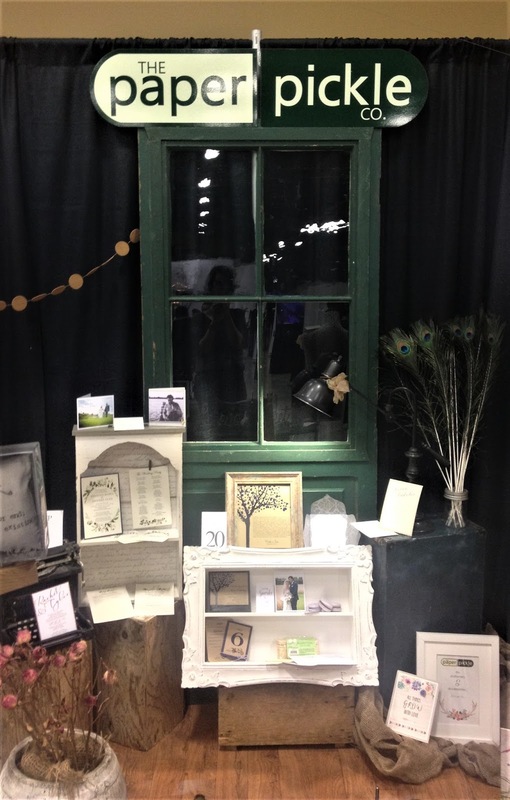 The booth looks stunning with our antiques and miscellaneous whimsy. I am quite proud! With Christmas successfully completed and enjoyed, it is now time to focus on those special upcoming events. 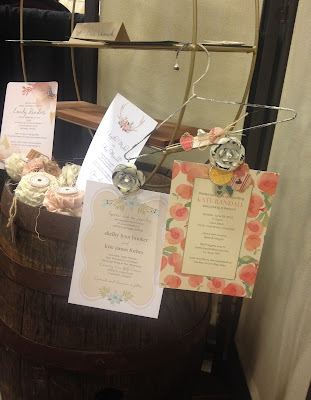 Perhaps you have a wedding, shower, special birthday or corporate event. Let me create something special for you. These hands have been hand crafting stationery for over 14 years and I love what I do. I adore hearing to your ideas and bringing your vision to life. 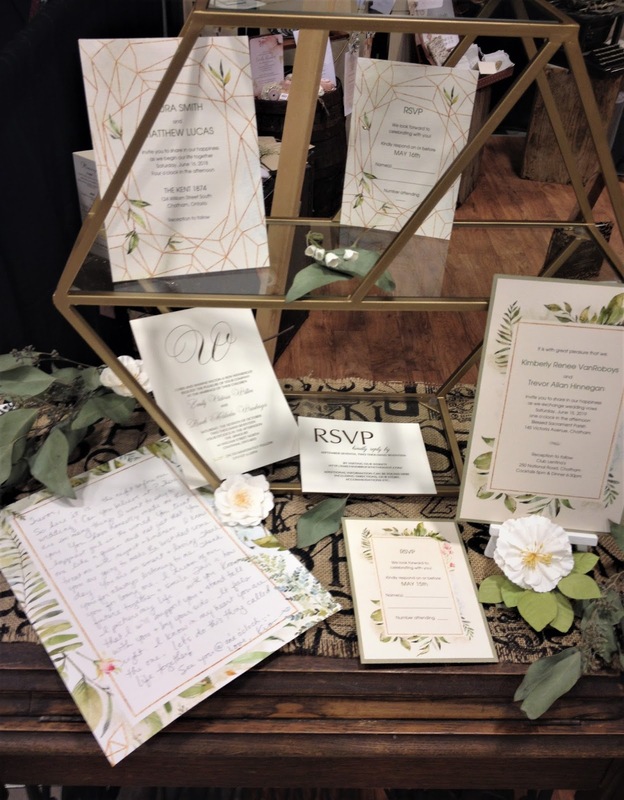 Invitations set the tone for your event. What does this invitation say? Inside the Wedding Invite "Album"
I was thrilled when Katie approached me an told me she and her fiancee loved vinyl (I do too!). But not just that. 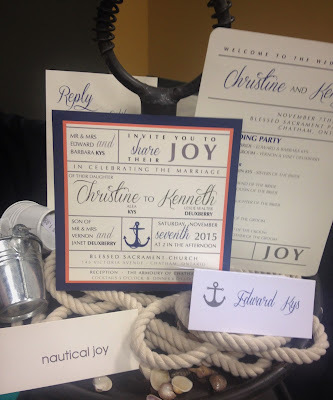 I had this idea of incorporating "vinyl" into her formal wedding invitation. This is our CD case (that we have been carrying for one million years in the store) and a burned CD of all the songs Katie and Mark love. Beautiful images from their engagement session stole the show both inside and out. Instead of the over used song lyric "All you need is Love", I did a little searching and found this quote from John Lennon "You is you, you and me. Love is knowing we can be". Original....check. Simple....check. Perfect....check! The CD also acted as the favour for their guests. This invitation screams....cool wedding alert. I must attend! This is just one example of my work. Set up an appointment and share your ideas with me. 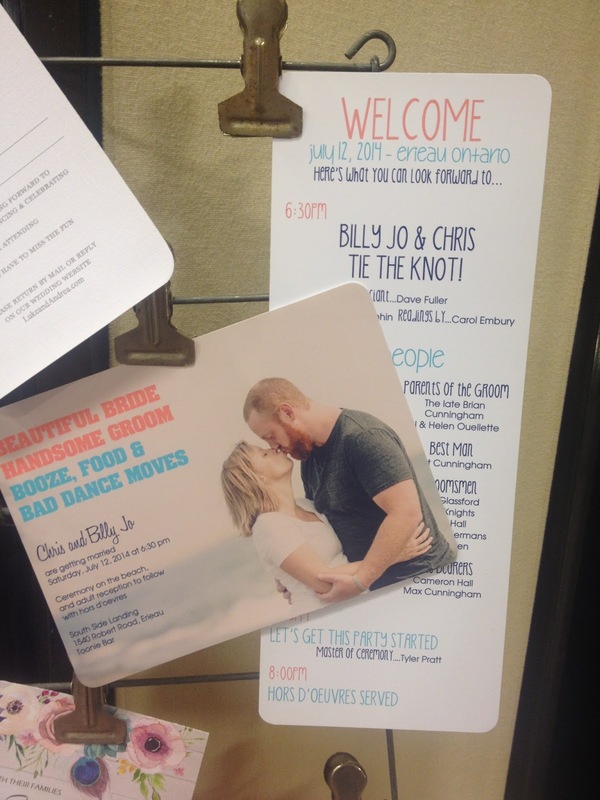 Don't assume everyone will just be throwing out your invite. If it is something incredible and unique, it will be tucked somewhere safe for your friends and family to cherish. 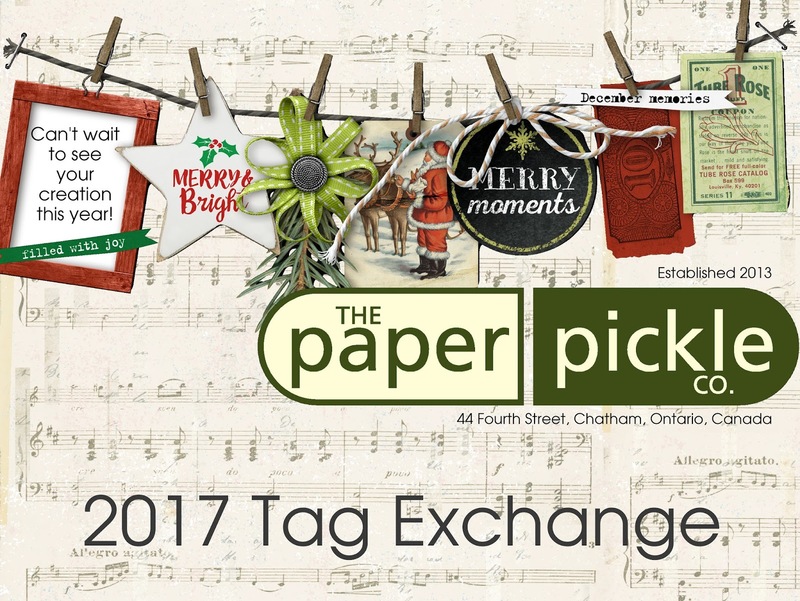 Now in our fifth year, The Paper Pickle Christmas tradition continued. Coordinating this tag exchange is so rewarding for me. It is so exciting to see who chooses to join our swap. It is even more fun seeing what the ladies create. 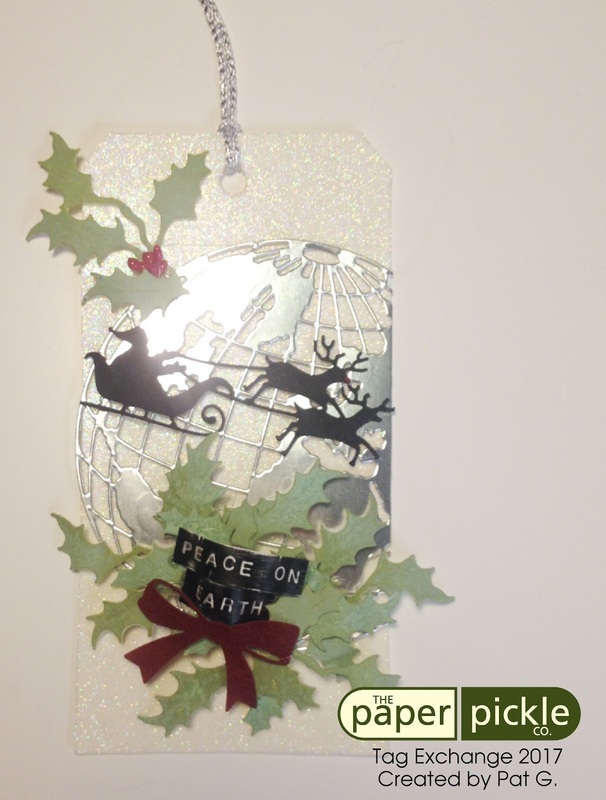 Christmas tags are so wide open for interpretation, creativity and magic. These 23 individuals deserve a round of applause for their efforts this year. VERY well done, my friends! All tags are now proudly hanging in the store. I encourage you to stop in and see them. Many are decorated front and back and are only truly appreciated in person. I will leave them up for the month of January for your viewing pleasure. 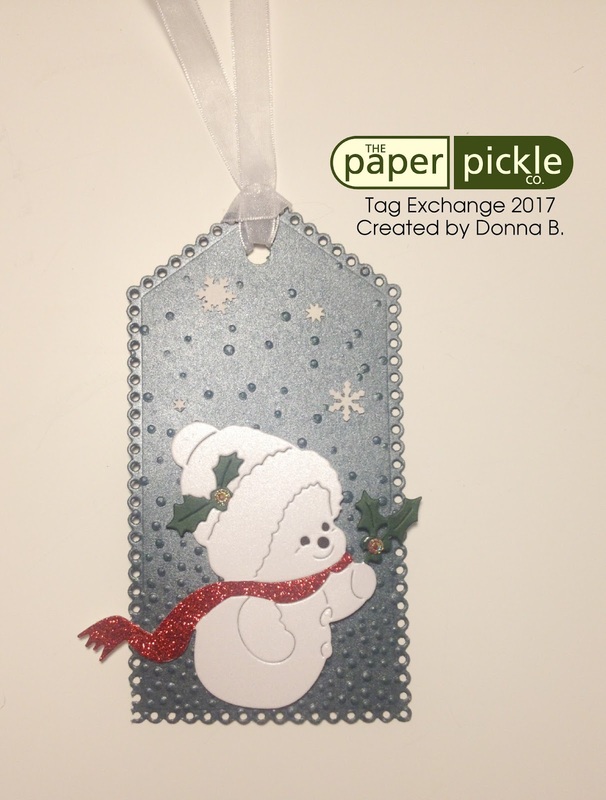 I love Barb's tag this year. 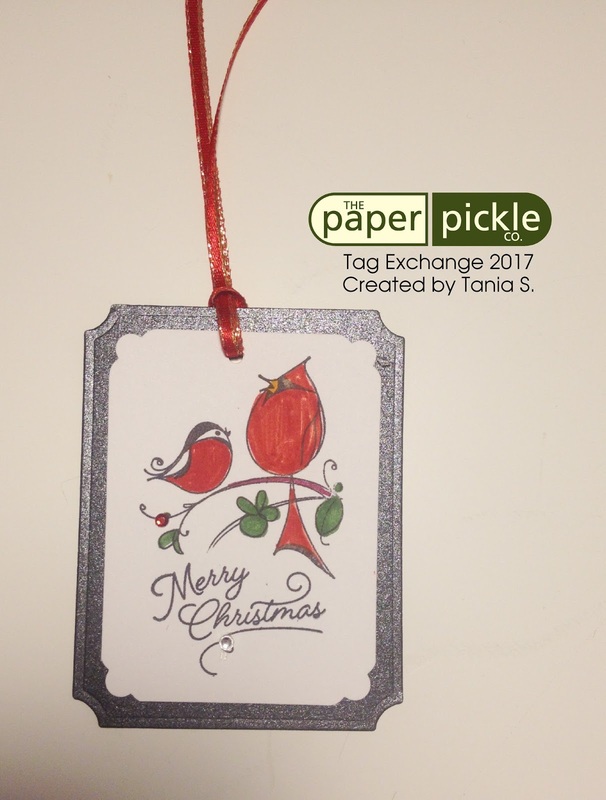 She used Memory Box's Merry Christmas to You die as the base of the tag. Boy does that die make you look like a superstar! 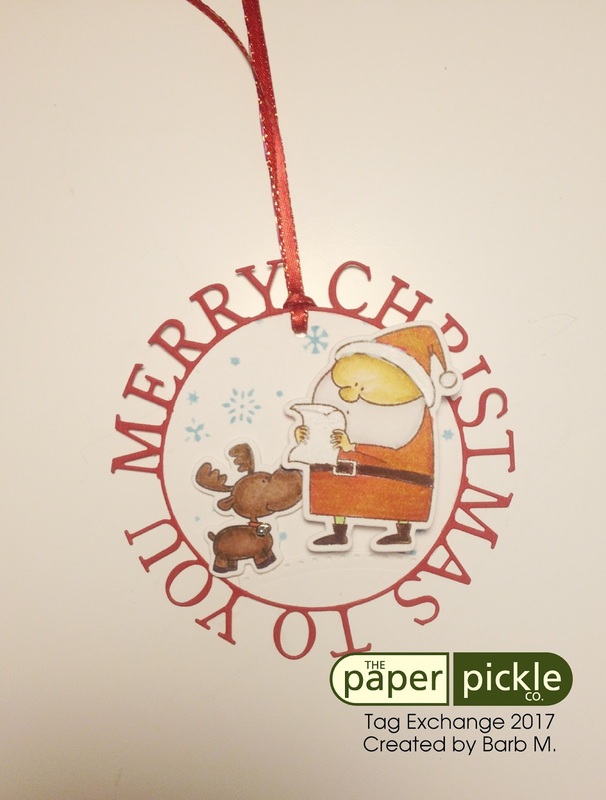 Santa and the reindeer are coloured beautifully with a subtle snowflake stencil used in the background. Santa is attached with a Art Impression action wobble and bounces around as you move him. I love this! Bonnie's shaker card is regal beyond belief. Saint Nicholas is so majestic with his staff, tree and bag of gifts. The sequin choice, beads and more are perfect with the colours found in this image. Bonus points for the use of lace, cheese cloth and ribbon. Bonnie stitched around the entire image to seal the shaker. Awesome! 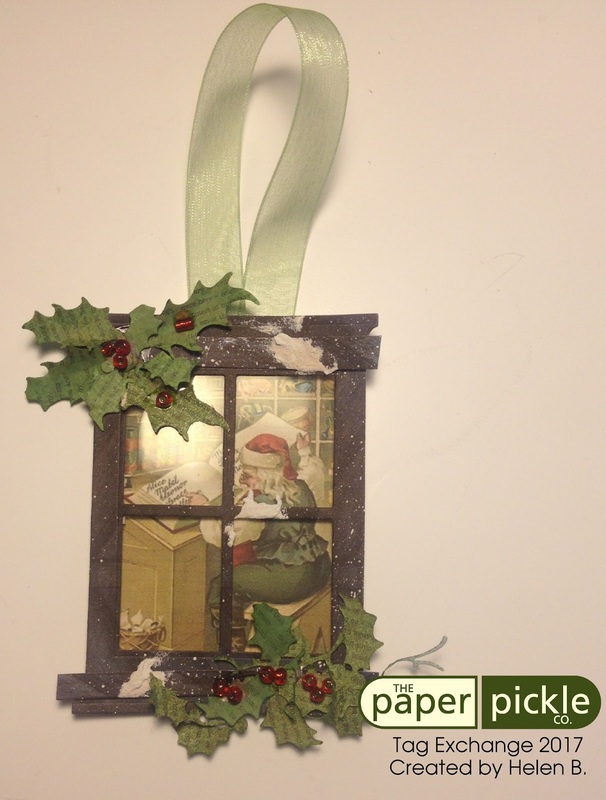 Bonnie submitted TWO entries again this year. Any of you who have joined us for this swap will realize just how incredible this is. Making 13 elaborate tags is very time consuming....let alone 26! The yellow gold is fabulous and the glittery angels sing. 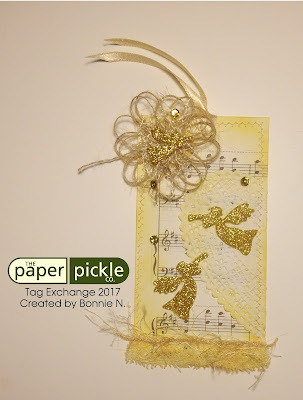 I love the sheet music background paper that pairs beautifully with the die cut angels. Bonnie also used a heart shaped doily and wrapped it around the tag. And you know me and my signature twine....never have I used twine to make a flower! I must ask Bonnie just HOW she did this! 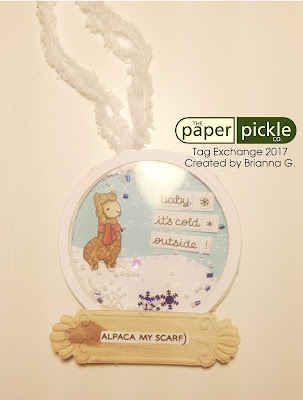 Ahhh....Brianna's tag is an adorable shaker snow globe with the cutest little alpaca. She asked me to bring this little stamp set in from Lawn Fawn in the fall and I am so glad she did. It is so cute that I had to buy it for myself as well! If you remember from past year's, Brianna is our youngest tag swapper (she is 10!). She and her mom and grandma all get together to make tags each year for our swap. This melts my heart. What a tradition and what memories! It was hard for me to capture just how beautiful this tag is. Carol scored big points with me for her white on white tag. The sky has been embossed to add texture and the sweet little houses and trees dressed with glitter. 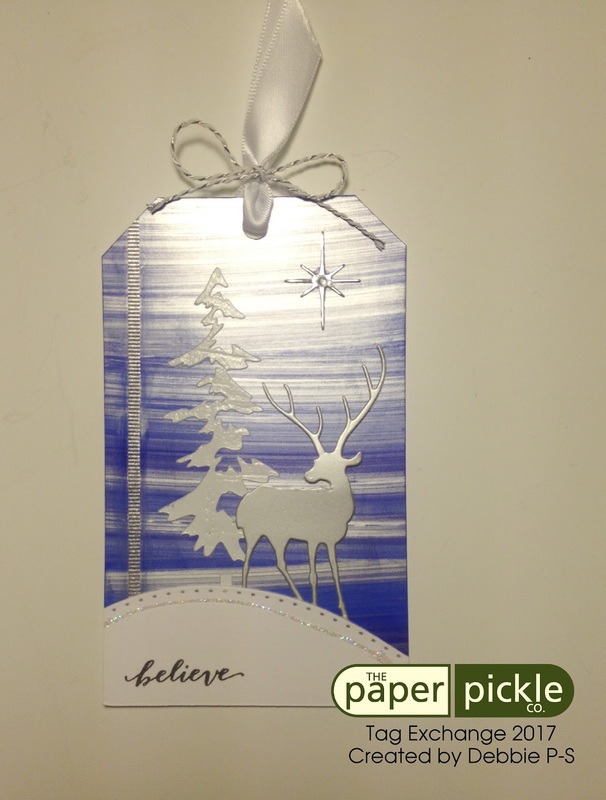 The subtle aqua touches including, ribbon, sentiment and singular star make me smile. There is something magical about Debbie's tag. 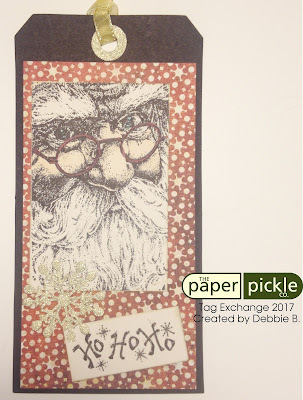 I think it is that vintage Santa face stamp she used that tugs at my heart and makes this design an instant classic to be used year after year. 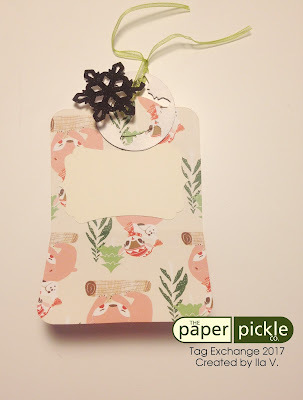 I loved how she dressed the matte paper design with beautiful gold POW paper (used on the snowflake and reinforcement). Debbie's tag is electric! You have to see this metallic shine for yourself. It is awesome. 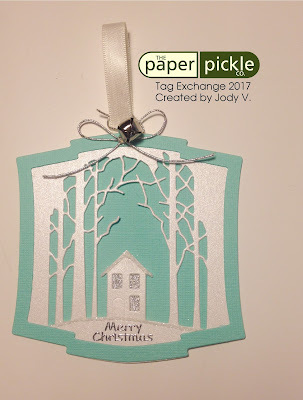 I love the use of embossing paste on the tree to add beautiful texture and contrast. I also love the star with rhinestone set in the sky plus the simple "believe" stamp in the bottom corner. Everything about this tag makes me say wow. Now anyone who knows Donna, knows that she loves her dies. 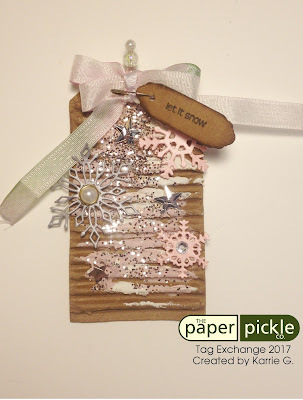 This tag showcases some of her beautiful dies including little snowman, snowflakes and more. 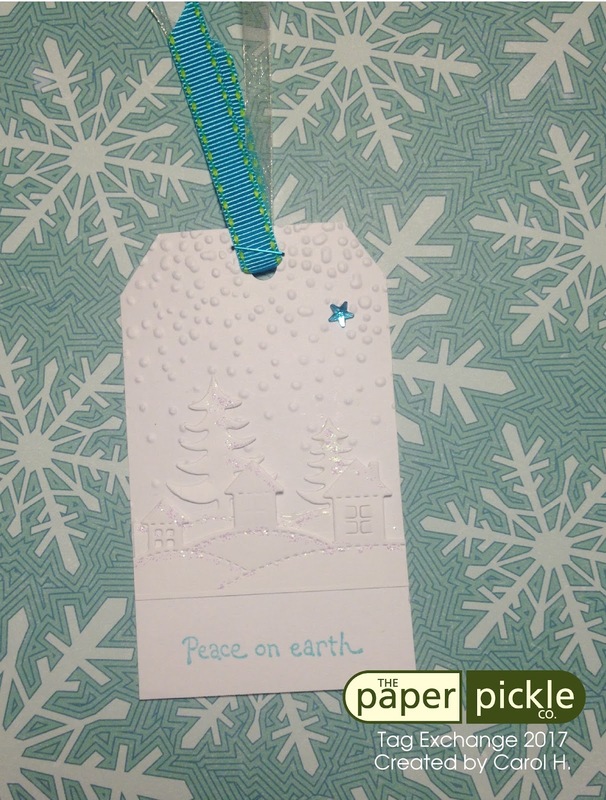 The tag itself is a die and I love the scalloped, doily style edging. The little holly berry details are a little rhinestone sticker and they are such a nice touch. Elizabeth's angel tag is full of whimsy. 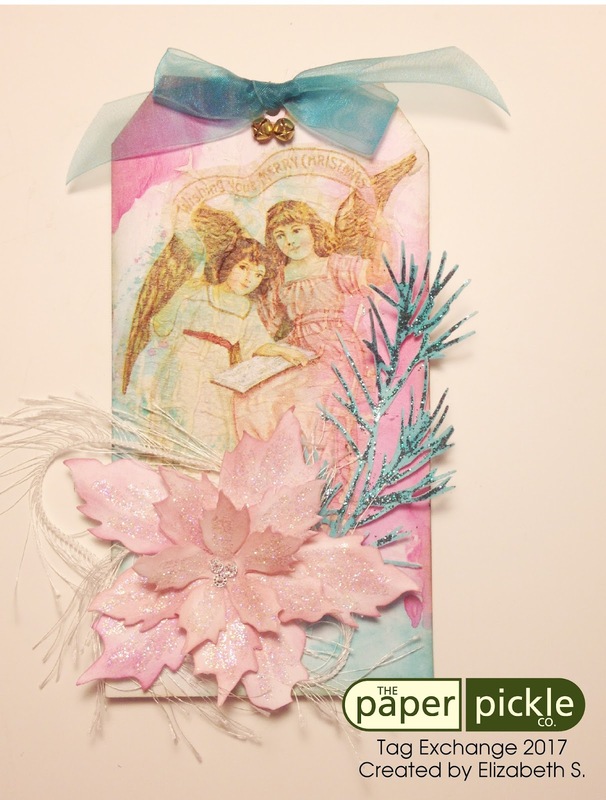 I love the aqua and pink colour combination and oh how the glitter on the poinsettia and leaf makes this tag shine! Details like the jingle bells and rhinestones in the centre of the poinsettia are perfect. I think my favourite detail is the fibrous ribbon used behind the dimensional poinsettia. Bravo. 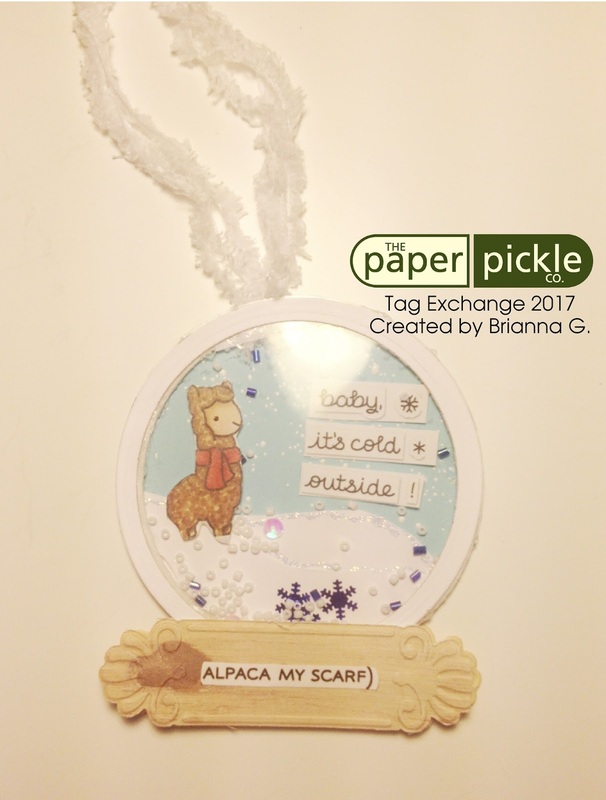 Helen is Brianna's (alpaca tag above) grandmother who coordinates the three generational crafting days. Over the years, I have noticed Helen loves to add texture to her vintage creations (note the artist cement used on the window to give the allusion of a real winter window pane). You should see the beautiful holly leaves that have a subtle dictionary style word detailing. Real red beads are used as holly berries and is so wonderful and adds a touch of class. We all know Hilary as the queen of technique. Her tag this year is so rich in colour from the background sky to the ribbon which she hand died herself! 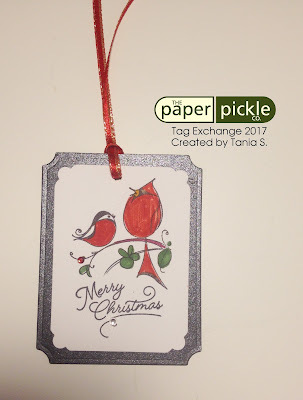 The Penny Black branch stamp was heat embossed in white and Hilary added a glossy berry accent to the branches which gives this stamp a new look and a new purpose. I wonder if Hilary would die me a blouse in these colours? Gorgeous! I really enjoyed Ila's tag this year. It is reversible with either the red deer paper being the focus on the outside or the cute little animals being the focus. 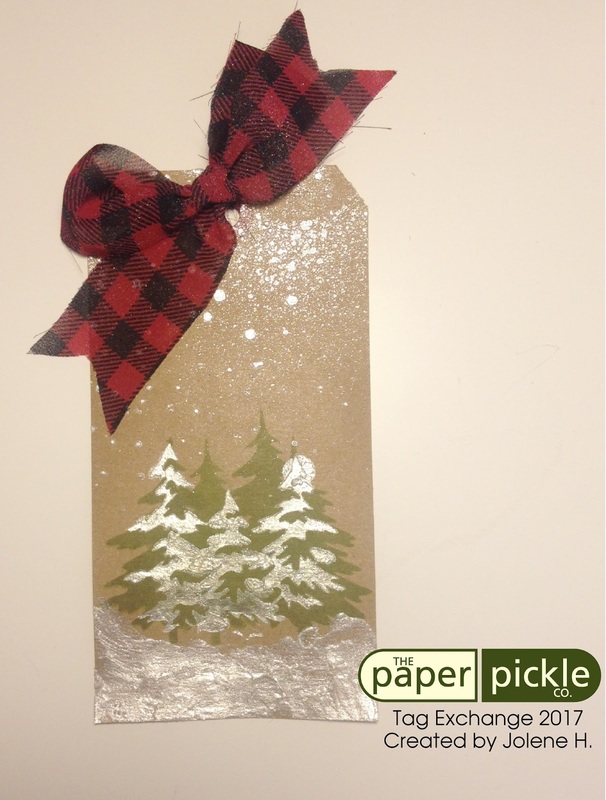 She had die cut the snowflake out of POW paper to add extra shine. I also like the die cut tag on the inside to add a special message to your loved one. Here is the tag opened up. Lovely. Ok. Jasmine's "tag" has set the bar for tag entries way up in the stratosphere! We have had some elaborate entries over the years but this one is definitely the most unique with her use of upcycled flatware, dominoes, checkers and more. She has used the Prima Rose Quartz paper, beads, mini bottle brush trees and more. 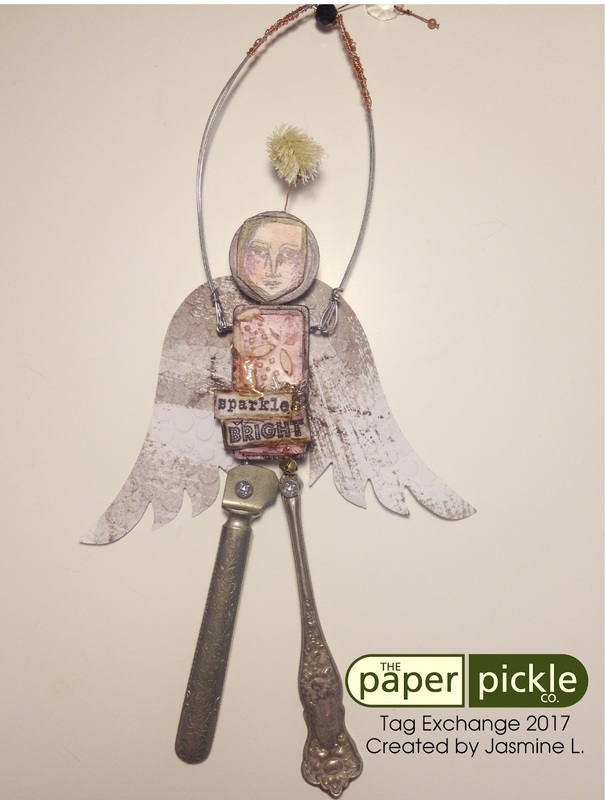 My daughter Julia was lucky enough to be in Jasmine's group and her angel now hangs as part of her gallery wall. Such a special treat. Bonus points go to Jasmine for her presentation when dropping off this load of tags. Layers of ledger paper separated the 13 angels. Anyone who knows me know that I am an accountant who loves all things vintage including little bits of history such as this. I am taking notes from Jasmine and I plan to repurpose this ledger paper on a future project! 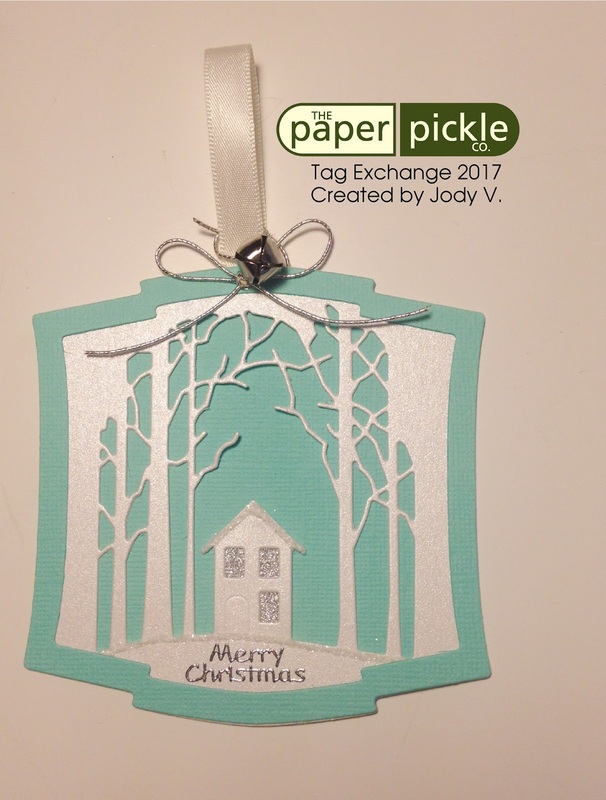 I love that Jen's tag reminds me both of a present and a beautiful winter scene. She has stamped trees and added a snowy landscape from these two adorable deers. 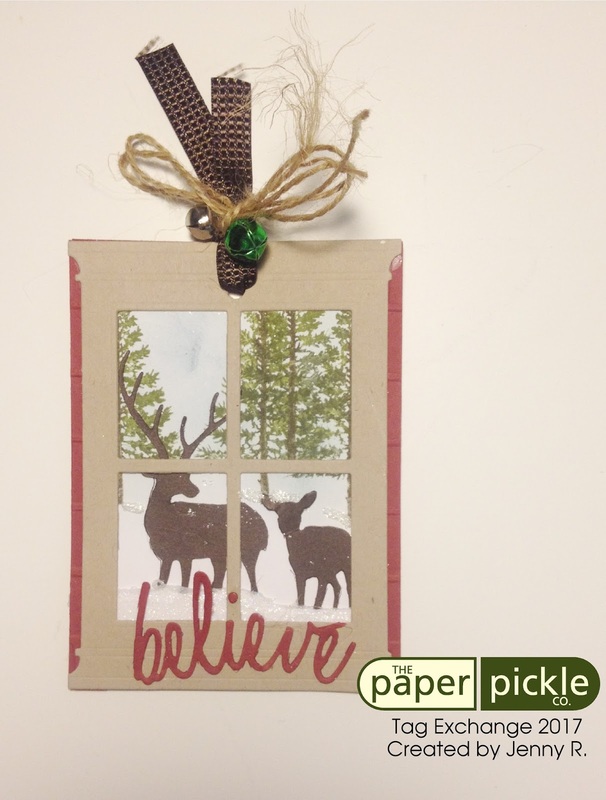 This impression obsession deer die has been so popular and for good reason. They are so versatile and just the perfect size. 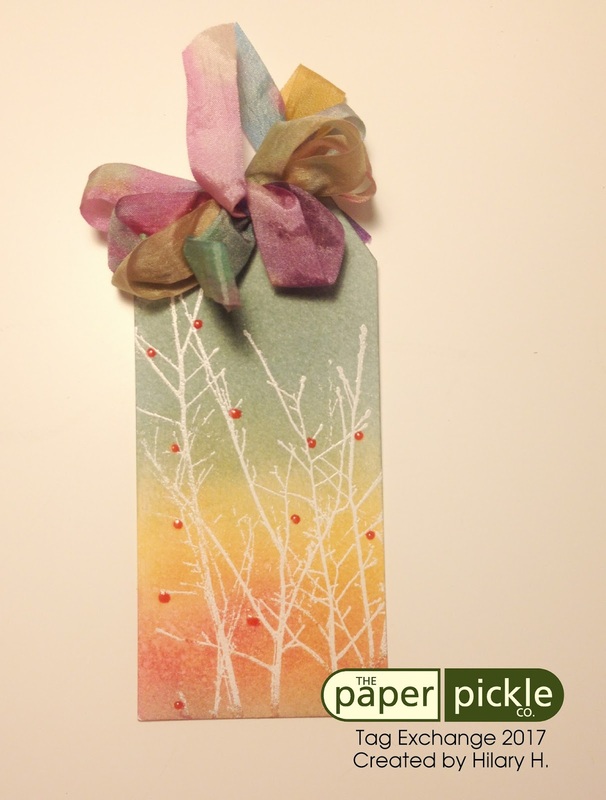 Anyone who receives this tag will fall in love with the beauty of the season. Ok. Jody's tag is so elegant and clean. I admire her design and may have to copy this in the future! This little cabin set in the forest is tranquil. 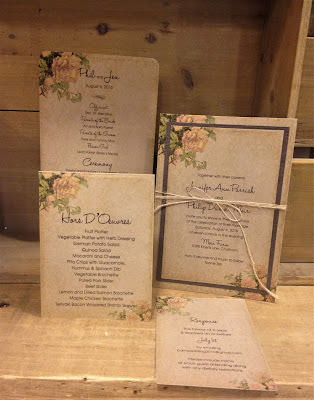 I love her contrast of matte and shimmer card stocks. I adore her subtle touches including the jingle bell, peel off sentiment and glitter. Such a beautiful shape as well. Jolene's tag is certainly on trend with her use of kraft paper and lumber jack ribbon. 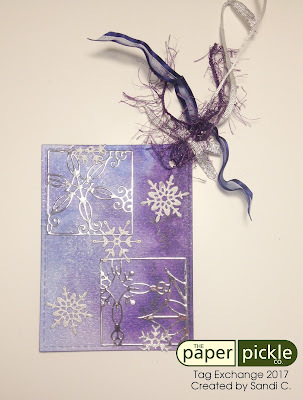 She used the Tim Holtz stencil with both ink and pearlized embossing paste to create a magical winter scene. The pearlized paste really makes this tag standout. Am I allowed to gush about this design? Yes, I am. My little "tween" Julia asked if she could be a part of our exchange this year. Being her mother and organizer of the swap, I felt it was my duty to say yes. Ha. I did tell her that she had to put great effort into her design and execution. Well she did both! She knew she wanted to use this MFT die of the cell phone. 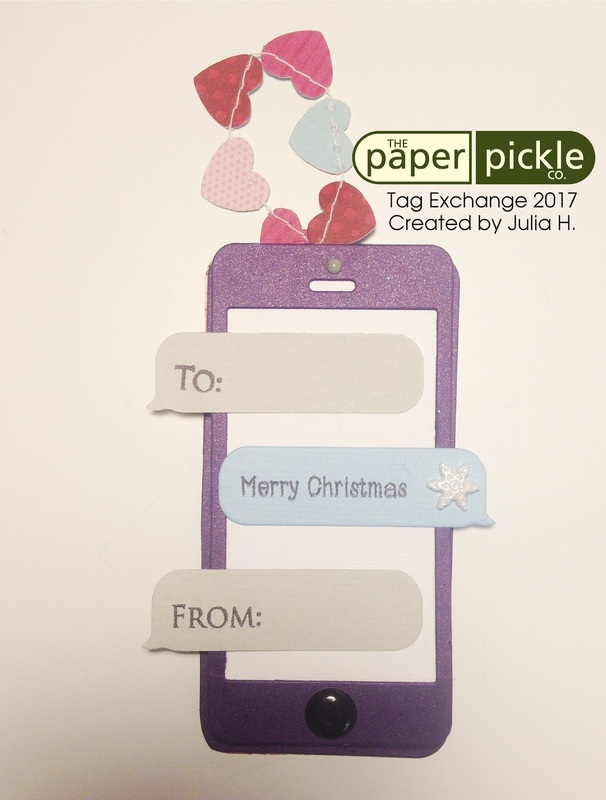 She also knew she wanted to make the tag creative and practical by using text boxes. Julia came up with this design all on her own and let's just say she made me proud. Karrie's tag has that wonderful upcycled yet elegant look and I may be in love. I am drawn to things that contrast. The tag is made with portions of an actual box. The box is then transformed into an elegant, feminine flurry of winter magic with use of artist cement, shimmering snowflakes, glitter, sequins, beads and more. Yes, Karrie.....let it snow! Oh Kathy! I love how each year you use traditional dies and colours to create a classic tag. 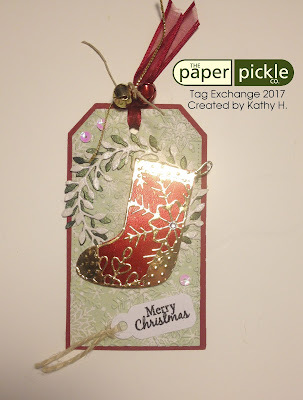 This stocking is certainly the star of the show with Kathy's choice of gold mirror paper. 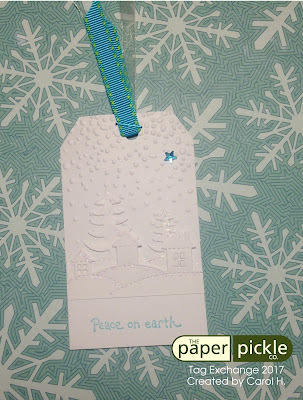 I also enjoyed the snowflake embossing folder used on designer paper as the background. The positioning of the stocking to the right of the wreath is also very pleasing to the eye. Beautiful. Kim H? That's me! Anyone who has been observing my creations over the years will know what I love working with sheet music stamps as my backgrounds on Christmas cards (as seen on my Zonta card this year and in past years) and now here again on my tag. I'm not sure why. Maybe it's because music is constantly playing in our house. Maybe it is because it is the perfect, beautiful, subtle addition to any project. This tag came about because I really wanted to work with this River Faerie die from Poppy Stamps. She reminded me of the sugar plum fairy from the Nutcracker. 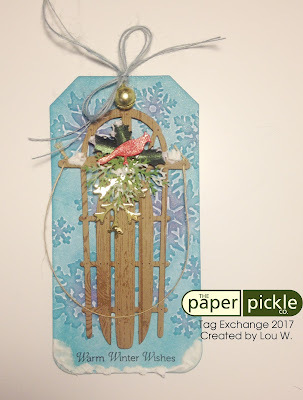 The stamp is from an old MFT stamp set that I used a few year ago on tag exchange design. 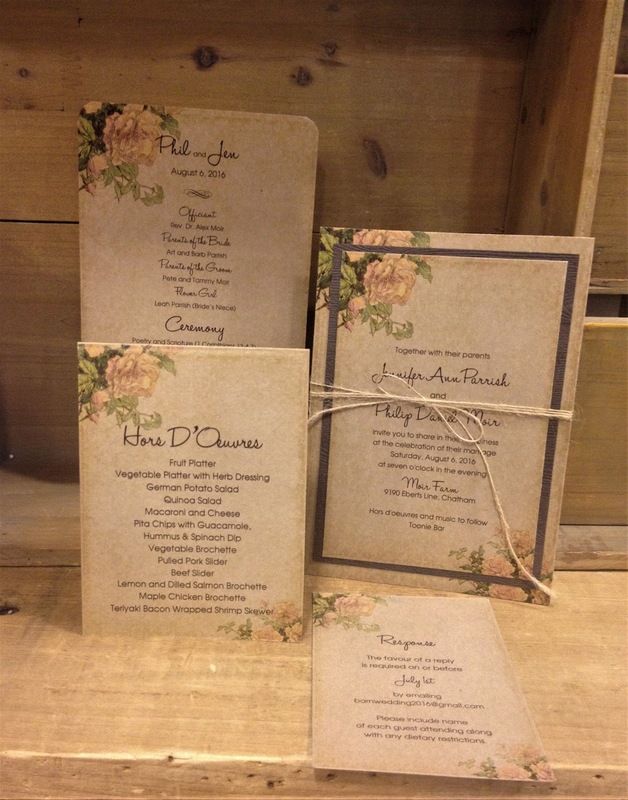 The shimmer papers and ribbon add elegance to my design. This makes me happy. Lou. Lou. Lou. Oh how you outdo yourself year after year? The colour choices are beautiful. And I am so glad you used that Elizabeth Craft sled die. It is so gorgeous. The little touch that I love best? 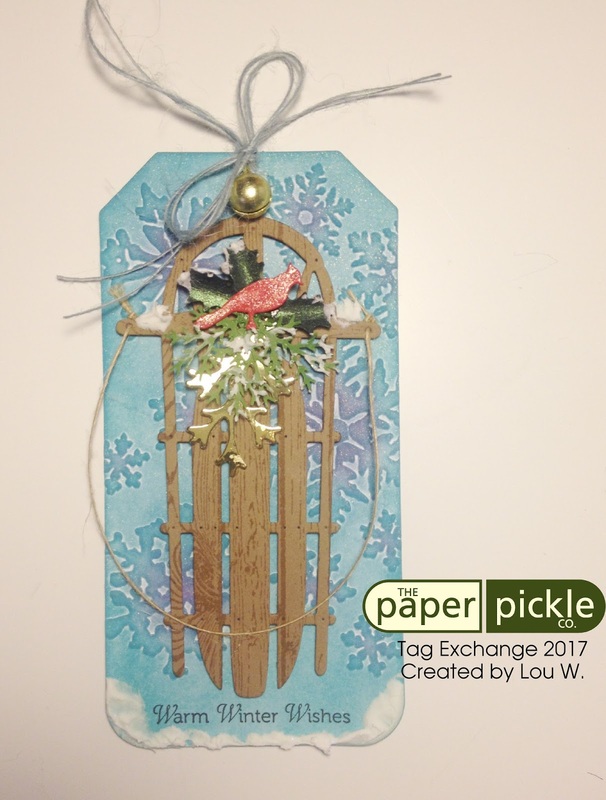 How Lou used a wood grain stamp to add "texture" to her sled. This is brilliant. The addition of the snowy bough, cardinal and twine handle is also quite impressive. Every year, Pat sends her tag entries via mail as she lives nearly one hour away. Every year I wait with great anticipation for that parcel to arrive so I may be the first to see what Pat has landed on for her design. 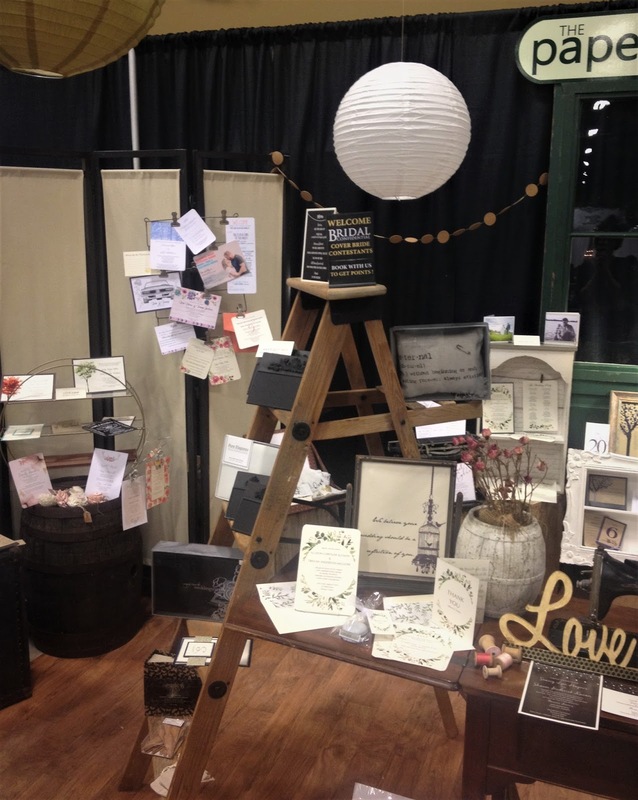 I think I can say with confidence that Pat loves Tim Holtz products (who doesn't?!?) and often creates a tag that is "Tim worthy". Well she has done it once again. The contrast of glitter ritzed background to the mirrored globe to the felted santa and holly leaves. Pat's "scaled back" tag is out of this world. Sandi is another paper craft who loves to get her hands dirty and loves to play! 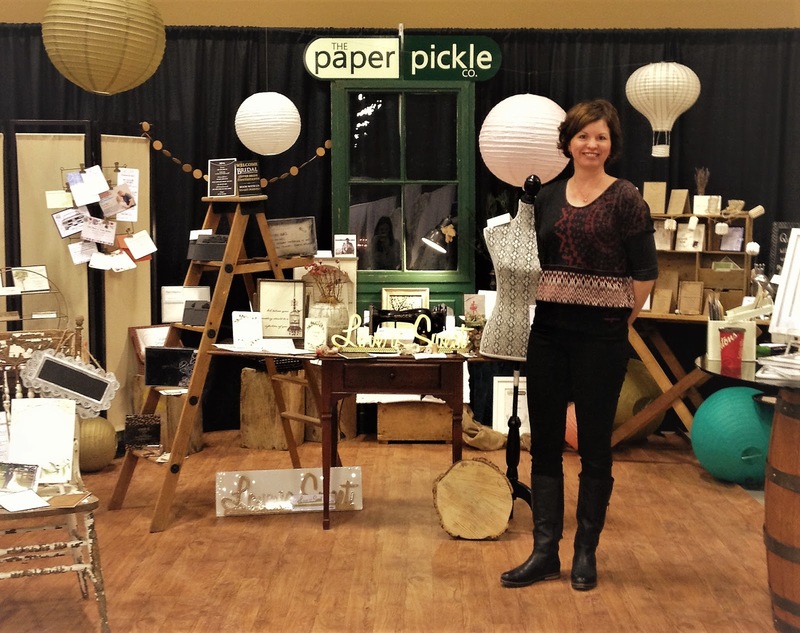 She works with a range of product to create backgrounds and cards that are unique and one of a kind. I often have to ask Sandi "How did you do that?". The regal blues and purples are so beautiful and her choice of silver mirrored paper for these gorgeous Spellbinders dies is perfection. The POW paper snowflakes and stitched edges are awesome. Don't forget to flip this tag around when you are in the store. The back is nearly as gorgeous as the front. Tania I am so glad you joined our swap this year. I have always loved this stamp. Her use of rhinestones and shimmer cardstock is gorgeous. 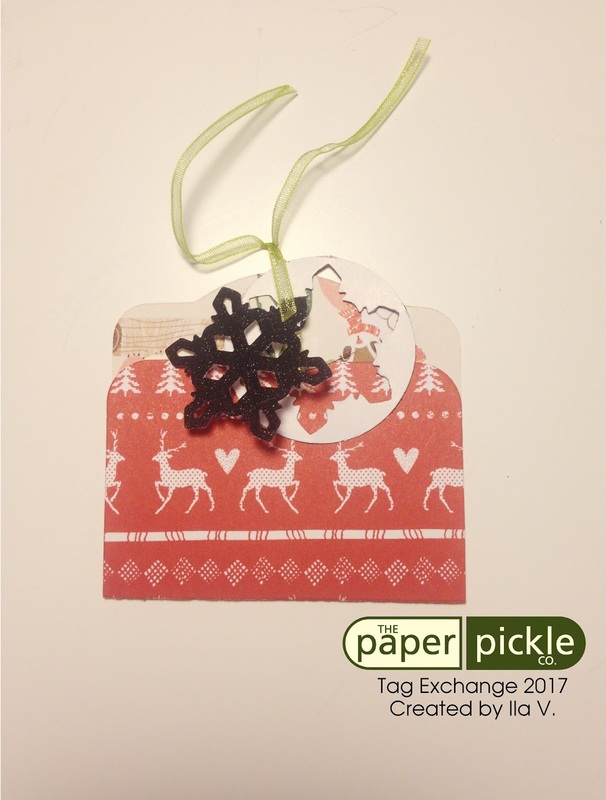 Anyone would enjoy receiving this tag! A $50 prize pack was on the line for anyone above who worked with Paper Pickle products. And the winner, as chosen at random by my son, is......Pat G. Congratulations. Swing by during store hours to grab your goodies! And thank you again for everyone who join the exchange this year. Keep on creating and keep on having fun. You are an inspiration and the reason I keep doing what I do. A very HAPPY 2018 to you all!! Wishing you only the best today and always. Let's make this the best year yet.